It’s getting closer to the end of the year – But it’s great to see customers who are still installing their Log Cabins, even with the temperamental weather in the UK. For example Mr M – Who has very kindly sent in some pictures of their Jos Log Cabin installation, which has been transferred into a cosy Gin Hut! These rot proof packers are worth considering and helped me out greatly throughout my build. After spending great effort ensuring a near level slab base I still used these packers to take up any gap such as the slight skirting to slab edging. I would always recommend a wet mix of sand and cement rather than dry. Then I cut and filed down the tongue. Screw fixing of first wall panels. 2 per board is an ample amount, screwing them approx 150mm from ends .From this point assembly is quick. I clear coated all tongue and grooves throughout. Note the space which I left for required annual wood preserving. This is essential in prolonging the life of your cabin. Don’t be tempted to squeeze into a corner to maximise space! Build coming along, wood preserving as I went. This helps maintain the cabin colour from expected expansion/contraction movement particularly in 1st seasonal settlement. Note the upside down section of door frame top. My tip and is best practiced throughout construction – place prior to securing. This was easily corrected later in the build and then squared and secured. Time for the roof. The roofing timber was less awkward than expected, beams to kingpin are pre-angle cut- a job made easier with another pair of hands. I chose to add further protection by stapling in more DPM sheeting prior to shingles. I also decided to use the 75mm board from delivery pallet rather than the 40mm barge boards supplied. I reckon it is better proportioned to the final look of the roof. Time spent on the double angle cut where boards meet. Cut with green and trial fit to achieve best fit. Shingles on! Choose a dry day so as not to trap moisture and preferably a day warm enough to bond the bitumen strip. Watching the pyramid roof shingles video Tuin provide was particular helpful. I decided to further weather seal the foundation by adding folded sheet metal. This was bonded to slab using sikaflex EBT external sealant then primed and oil base coated. Floor time! More DPM sheeting and floor joists approx 300mm apart. Note more use of glazier packers to help level out the base. You could also use off cuts of shingles if required. Jablite boarding to help insulate underfoot… I purchased the optional 27mm flooring. Ensure the flooring is nailed tight with approx 10mm gap all around acting as a floating floor. The window latches were installed with more glazier packers to help centralise to frame. Off setting the second pin was another helpful tip from Tuin to add better seal when window in closed position. Personalised wee gin den! I also picked up from previous customer review about finishing above the door with edging. A nice finishing touch. A great way to lay the rules straight for gin. Project complete. So happy with the cabin Tuin supplied. I decided to go with a preserver which was in keeping with our house. There are some lovely new colour choices in wood preserving but I opted for the more traditional look showing the beauty in natural wood, knots n’ all. Don’t be frightened to have a go, and don’t rush your build, enjoy it! Some reviews mention about done in 2 days etc… Yes you can assemble quick but my advice is to allow for several good quality preserving coats remembering to take into account drying times and unpredictable weather. Protect as you go and don’t feel rushed into completing. 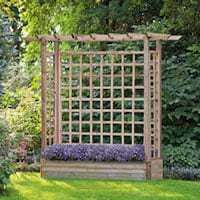 I hope this review gives you some useful pointers and demonstrates the well built garden spaces Tuin provide. Well done Tuin for having such a fantastic range of product and very reasonably priced. Your product deserves the time and feedback to allow you continued success within your field. … Now time to enjoy our new space with a gin or few! Some very handy tips in this review, I love the sign above the cabin door! The end product shows how perfectly the Jos Log Cabin can become a cosy Gin Hut for two, truly marvelous! Thank you again for sending this in. Interested in more reviews like Mr M’s? 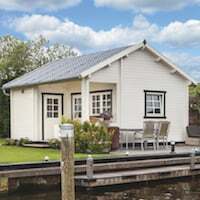 You can find more with a range of cabins at: Tuin Pictorial Customer Reviews. Hi everyone – It’s been some time, hasn’t it? Now that the seasons are changing it’s starting to get quieter for this industry, but we do still have customers installing their cabins! For example, Mr M’s installation of their Shepherds Hut Deluxe to which he kindly sent in some images along with some commentary and tips for future installers. A stable-full of beams and panels. Get it all under cover if possible. We started off by completing the base after correcting the three warped centre joists with modded joist hangers. Note the bases – just paving slabs laid on a bed of sand. Nearest is a thicker cast concrete slab also laid on sand to correct for the slope away from the wall. Apply preservative and stain/paint as many parts as practicable before assembly – pay particular attention to the end grain. Flooring goes on late into the evening – note two teenage helpers; almost as essential as the tea and hammers. Also note the clamps – you will need them. We are using cut-clasp nails. You will need roughly three packs – 14 nails in each board. It may sound overkill but it makes the base really secure, better safe than sorry. Sides are on in the next image, as are the steps and the door hinge beams. Pay close attention to getting the hinge beams vertical in all planes prior to the roof going on or the doors will be skew-whiff. The roof and doors are on the next picture, I did the doors first as the roof will get in the way. The roof is easier than expected, just keep it all tight at first with your sash cramps to keep it nice and square. This is a month or so after the previous pic – I fell off our original step ladder adding the first feather roof beam and cracked a rib. Highly recommended replacement cherry-picker ladder featured! The completed hut. Looks good doesn’t it? The picture was taken after first frosts of the autumn (October 5th). I haven’t added the eight end roof arcs yet. We plan to add a wriggly tin roof eventually, and the roof arcs will finish that off nicely. Note replacement glass fibre reinforced felt laid across the arc – there are six pieces all glued and clout-nailed with the overlap away from the prevailing wind – important in Highland Perthshire! Laying it this way uses less felt and we think looks better than length-wise. It is certainly easier to do as it has no tendency to want to slide off. I suggest that you check YouTube shed covering videos which show a proper drip edge rather than wrap the covering round the roof edge as the instructions show – that will encourage the rain water to travel up to the sides of the hut via capillary action and you don’t want that. Some very handy tips in this review, though we are sorry to hear about your step ladder incident – I hope it healed nicely! The end product shows how perfectly the Shepherds Hut Deluxe fits in with its surrounding garden, truly marvelous! Thank you again for sending this in. 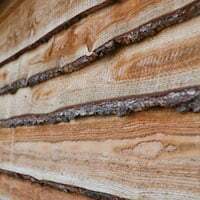 It’s been a little time since we’ve had an in depth customer review – Understandable with this heat, not many people would want to install their log cabins in the recent months. But we do have a fair few customers who like to challenge the heat! For example, Mr & Mrs C, who have kindly summed up their journey of their Newcastle Log Cabin installation within this article. 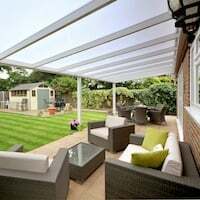 After weeks of research it looked by all accounts that Tuin were the people to buy from! And after several hours reading the wealth of information on their site I was not only convinced these guys knew what they were talking about, but also had a real passion for the product. 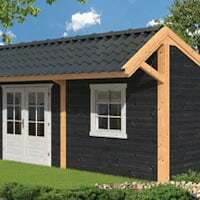 Si, I hit the button and bought a Tuin 58mm Newcastle cabin, to become my new office/workshop. The cabin arrived bang on time and unloading was a doddle with their side loading forklift. I was relieved to find the whole package was very securely wrapped and un-damaged. The cabin had to sit on the drive for a week as I finished off the groundworks, but the packing kept everything dry and clean. Access was tricky, but a concrete pump soon got the job done! Next, the build begins. (Seemed a shame to hide my nice retaining wall) Unfortunately, the cabin wall bearers had twisted badly in the searing heat. This made the first logs down a little tricky, but as the walls started to go up the bearers had little choice but to flatten out. Every log slotted into the next like they were machined out of metal, I was amazed at the accuracy of each cut. The logs were straight and clean – I was starting to feel quite happy! End of day one! Apart from being sick of hammering nails into roof boards, everything else had gone like clockwork. Next day came the doors and roof. (Oh, goody, more nails!) The shingles were of excellent quality and easy to lay. I had opted to insulate from within the cabin, so we just laid them out on to the roof boards. I have now been in my new cabin for a month, during this time we haven’t had a drop of rain and 30+ degree temperatures! The cabin is drying out, but (so far) the wood is being extremely stable. The few small cracks that appeared as we installed it have (more or less) stayed as they were. Nothing has warped or buckled. 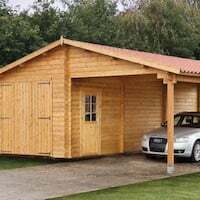 I really am being honest when I say, we are extremely pleased with our decision to buy a Tuin Log Cabin. Everything from start to finish has been great! I did have to call for a silly question and the aftersales help was brilliant – A big thank you to Alex and the Tuin team! I must say, that shade of treatment really does suit the Newcastle Log Cabin! 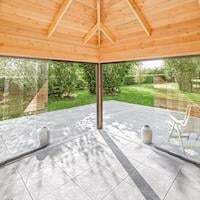 I’d just like to say a big thank you to Mr and Mrs C for their honest review of our products – We are sorry to hear that you had problems regarding the flooring, but are relieved that you still love your log cabin! Interested in more reviews like Mr and Mrs C’s? 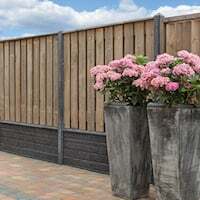 You can find a load more at: Tuin Pictorial Customer Reviews. Our Log Cabins have been put into use for a range of reasons: home offices, summer houses, workshops.. You name it! But one use that has become a huge trend lately is to turn the Log Cabin into a garden pub. 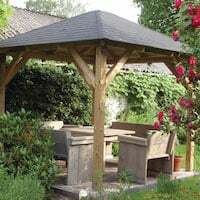 Pubs are just a part of British culture, you can’t deny it – So imagine the convenience of having one in your own garden, you’d gain the jealousy of all your neighbours! We’re lucky enough to receive a load of photos of these garden pubs- But I’m sure there are plenty more out there. 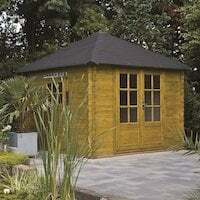 The Aiste Log Cabin proves to be a popular choice for many intended uses, especially Garden Pubs. Though when thinking of a garden pub, stock is a very important factor.. The Julia Log Cabin is a great candidate for a garden pub, at 3m x 5m there’s plenty of space to place the bar towards the end and space seating around the rest of the length- Ideal for large drinking groups. The Yorick Log Cabin provides plenty of light for cocktail hour. 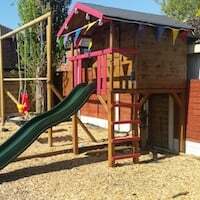 Just as I was writing this post – We even received another picture set of a converted Log Cabin, these customers used the Meaghan 4.5m x 4.5m Log Cabin as a spacial garden pub. A guaranteed neighbourhood favourite. This American styled bar is within an Aiste Log Cabin – Just look at the bar table! 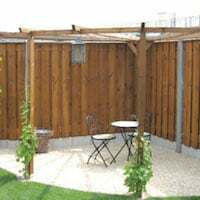 This is a recent Ingmar Log Cabin that’s been transformed into a garden bar – At 3.8m x 3m the Ingmar is an ideal size for those with limited space available, and they finished it all just in time for the England match! This Justine Log Cabin has been converted into an ultimate lounge area, one side is fitted with a TV and sofa, the other is turned into this beautifully monochrome pub area – I love the monochrome look in this cabin, it makes the cabin look bright and clean. And hey, don’t just take our word for the quality of our Log Cabins – the Tuin Trustpilot Reviews even appear to show this trend. Comparing our customer service and products to some well loved beer brands! Beer and cake.. Its a solid suggestion! If a garden pub isn’t for you, there are plenty of other ways to utilise a Log Cabin, see our Uses Of A Log Cabin post for plenty of inspiration!